This Land Cruiser was custom-built to be both classic and modern — perfect for city dwellers and off-road enthusiasts. This FJ43 was fitted with a Toyota 1FZ 4.5L engine with programmable fuel injection, 5-speed manual transmission and Old Man Emu suspension. Put that all together, and you get the kind of ride quality and fuel economy you’d expect from a modern 4x4. 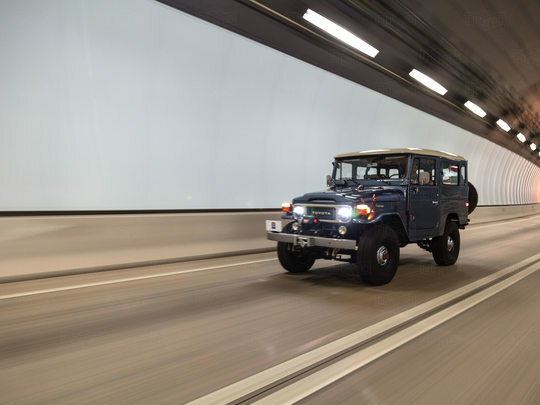 The exterior of the FJ43 was painted in Venetian Blue, a color inspired by a certain 1987 Porsche 911. This color continues into the cabin, where it contrasts beautifully with the saddle vinyl trim. Outside, you’ll find a super-tough hardtop and 33” BFGoodrich® tires - perfect for all-terrain, all-weather fun. Sure, you can go without air-conditioning, and your favorite tunes, but why would you want to? Here, modern conveniences are at your disposal - including Vintage Air A/C and a premium sound system with Bluetooth® , so you can let the good times roll.